Are all types of chocolate healthy? Before you grab a chocolate candy bar or slice of chocolate cake, it’s important to understand that not all forms of chocolate contain high levels of flavanols. Cocoa naturally has a very strong, pungent taste, which comes from the flavanols. When cocoa is processed into your favorite chocolate products, it goes through several steps to reduce this taste. The more chocolate is processed (through things like fermentation, alkalizing, roasting, etc. ), the more flavanols are lost. Most commercial chocolates are highly processed. 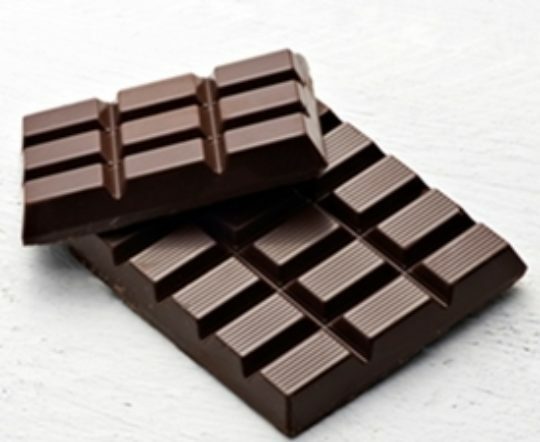 Although it was once believed that dark chocolate contained the highest levels flavanols, recent research indicates that, depending on how the dark chocolate was processed, this may not be true. The good news is that most major chocolate manufacturers are looking for ways to keep the flavanols in their processed chocolates. But for now, your best choices are likely dark chocolate over milk chocolate (especially milk chocolate that is loaded with other fats and sugars), and cocoa powder that has not undergone Dutch processing (cocoa that is treated with an alkali to neutralize its natural acidity). Flavonoids are naturally-occurring compounds found in plant-based foods that offer certain health benefits. They are part of the polyphenol group (chemicals found in plants). There are more than 4,000 flavonoid compounds, which are found in a wide variety of foods and beverages, such as cranberries, apples, peanuts, chocolate, onions, tea and red wine. Flavanols are a type of flavonoid specifically found in cocoa and chocolate. Flavanols, which give cocoa a pungent taste, "may be lost during cocoa processing". Some chocolate manufacturers are studying ways to keep high levels of flavanols in their products while still producing good-tasting chocolate. What about all of the fat in chocolate? You may be surprised to learn that chocolate isn’t as bad for you as we once thought. The fat in chocolate comes from cocoa butter and is made up of equal amounts of oleic acid (a heart-healthy monounsaturated fat also found in olive oil), stearic and palmitic acids. Stearic and palmitic acids are forms of saturated fat. You may know that saturated fats are linked to increases in LDL-cholesterol and the risk for heart disease. But, research shows that stearic acid appears to have a neutral effect on cholesterol, neither raising nor lowering it. Although palmitic acid does affect cholesterol levels, it only makes up one-third of the fat calories in chocolate. Still, this great news does not mean you can eat all the dark chocolate you’d like. First, be careful about the type of dark chocolate you choose: chewy caramel-marshmallow-nut-covered dark chocolate is by no means a heart-healthy food option. Watch out for those extra ingredients that can add lots of extra fat and calories! Second, there is currently no established serving size of chocolate to help you reap the cardiovascular benefits it offers, and more research is needed in this area. However, we do know that you no longer need to feel guilty if you enjoy a small piece of dark chocolate once in a while. So, for now, enjoy moderate portions of chocolate (e.g., one ounce) a few times per week, and don’t forget to eat other flavonoid-rich foods like apples, red wine, tea, onions and cranberries.